Yojisan is elegantly minimal but still celebrates exuberant playfulness. The spatial arrangement echoes the delicate harmony between the strong and silent elements of Japanese cuisine. Within a very limited space, Yojisan brings a surreal revolution to a city of tradition while staying refreshingly whimsical and modern. The result is a simple yet substantial visual impact inspired by traditional Japanese materials, culture and lifestyle. Situated on prominent North Beverly Drive and flanked by high end storefronts and towering palm trees, the newly designed Japanese restaurant introduces a refreshingly whimsical and modern touch to the neighborhood. 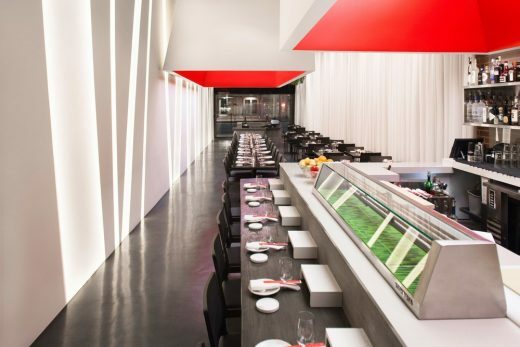 Instead of pandering to existing Beverly Hills clichés, the approach steps through the looking glass with Yojisan as sushi signifiers are upended. The result is a simple yet substantial visual impact inspired by traditional Japanese materials, culture and lifestyle. 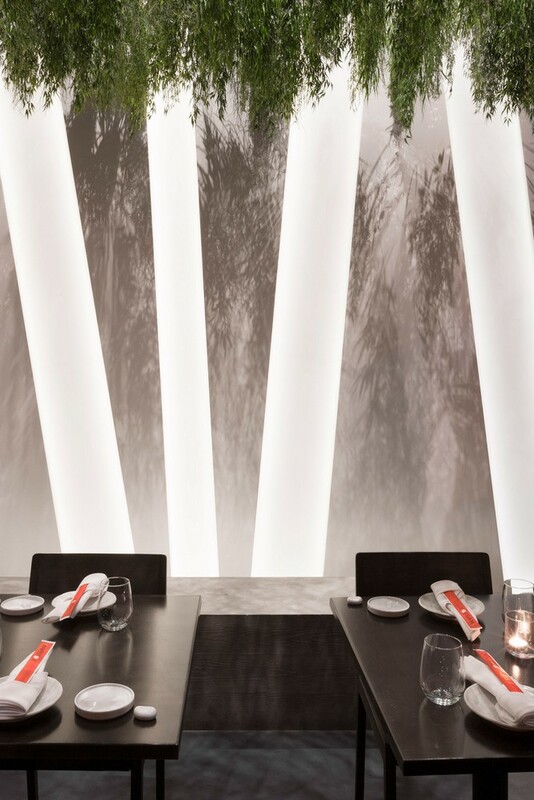 Diners experience Yojisan through a narrative of allusion and light. This subtle surrealism begins with Yojisan’s façade, which beckons guests to enter a threshold subdivided by a series of delicately intersecting planes. 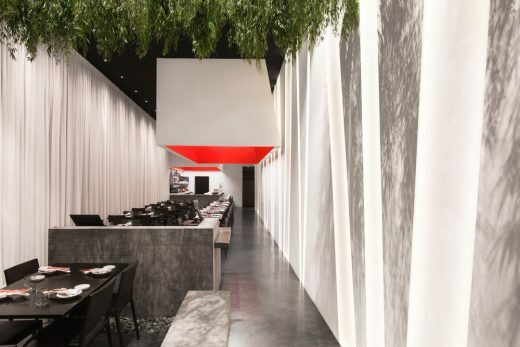 At first glance the façade appears as if it were metallic; however, as diners comes closer they are met with a succession of cedar planks that melt seamlessly into a seductively slim signage. 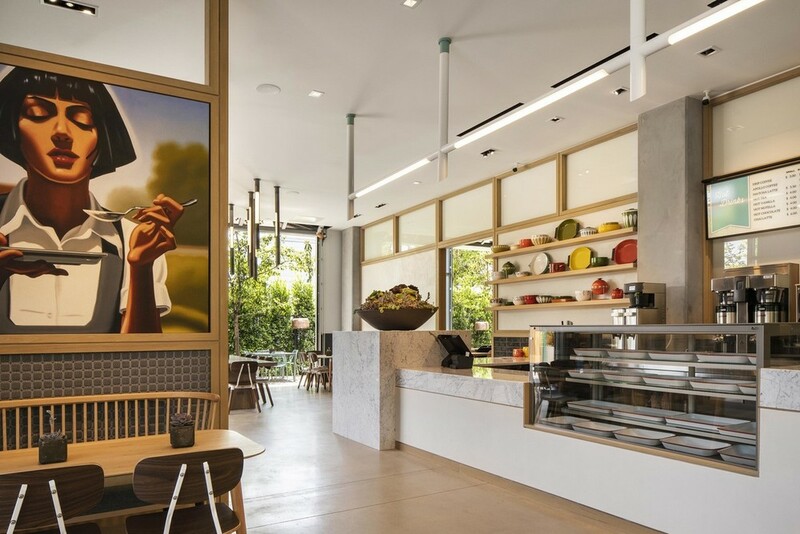 The design further synchronizes the entry by framing the outdoor seating space with the sign itself, which is crafted from repurposed steel once used in industrial shipbuilding. Upon entering Yojisan, diners walk under a floating carpet of leafy plants that spring from the ceiling and are lit from above. 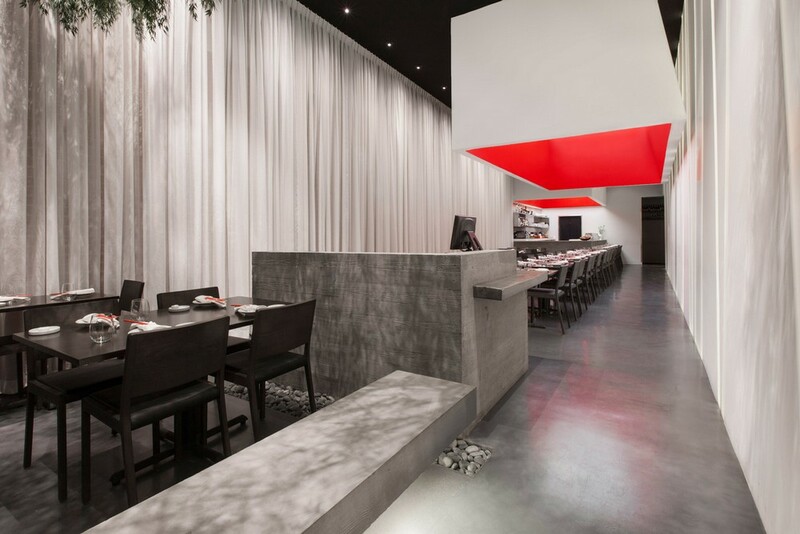 This design simulates a Japanese forest dreamscape unique only to the restaurant. The ceiling is slightly angled to force the perspective towards the back and elongate the space. To counterbalance the lighter design features of the restaurant, there are several grounding elements for diners as they approach the host desk and sushi bar. 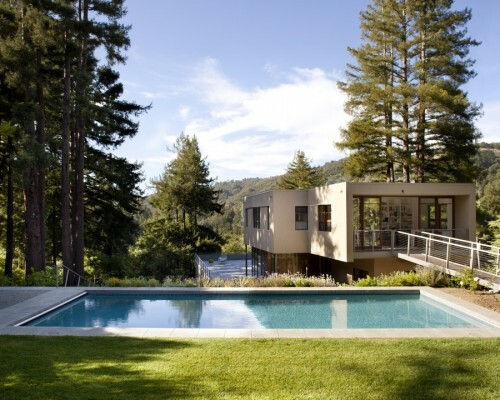 Comprised of sturdy reclaimed oak wood and board-formed concrete, these areas of high activity are given a sense of permanence and echo the rustic materials of the exterior space. 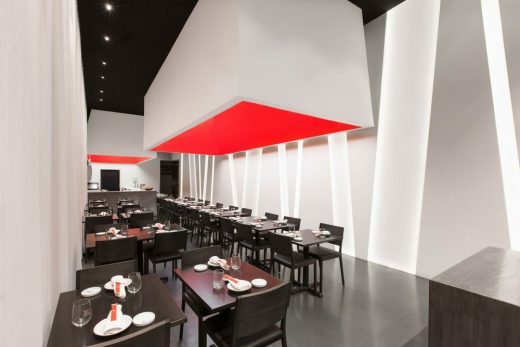 Beyond the host desk, the ceiling unexpectedly makes way for two giant, inverted bento boxes that highlight the central dining areas with a reflective red finish and provide a warm, emanating glow to diners below. Smartly situated underneath these deftly hovering volumes lies a sea of custom designed tables forged through a special process of bluing, similar to the fashioning of famed Japanese tools and cutlery. 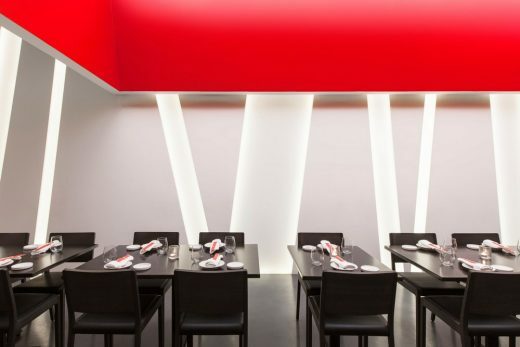 As diners are seated along the perimeter of the restaurant, two walls surround them, each with a unique purpose. The existing sandblasted brick wall reveals a warm russet material, which can be seen through a sheer curtain that softens the space and acts as an acoustic buffer. 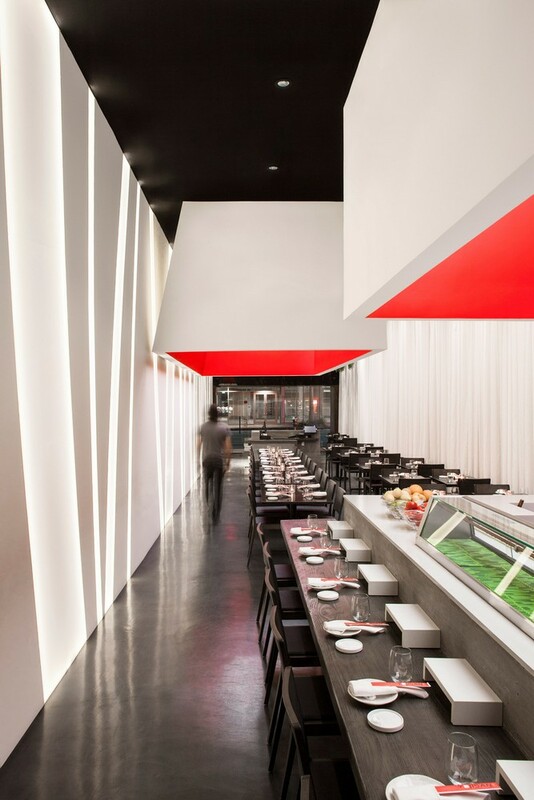 Running opposite this wall is a dramatic array of angled light coves evoking dynamic bamboo shoots that culminate at the ceiling. Each luminescent strand is clad with a custom-formed cloth and plastic composite. This wall provides the main circulation artery for Yojisan and evokes the sensation of traversing through a field of illuminated stalks by playing with negative space. 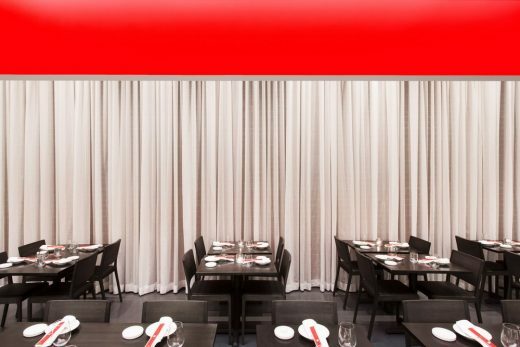 Yojisan is a restaurant that’s elegantly minimal but still celebrates exuberant playfulness. 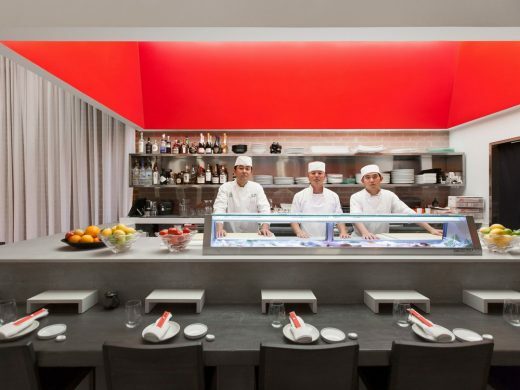 The spatial arrangement echoes the delicate harmony between the strong and silent elements of Japanese cuisine. 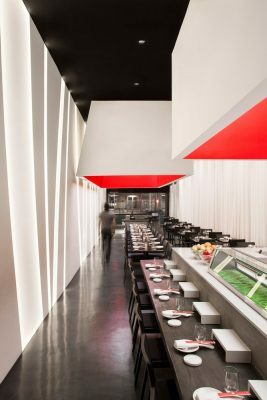 Infused into Yojisan is a clean light design that reflects the chef’s streamlined food philosophy and is discreetly resonant. 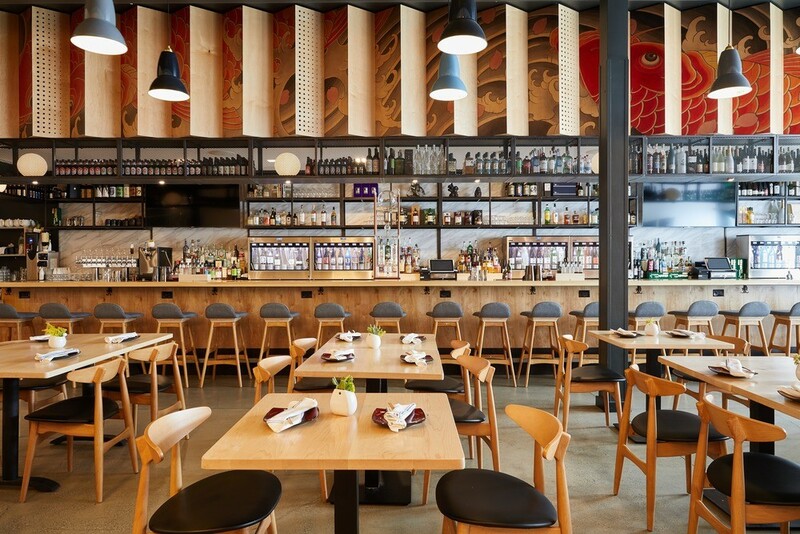 Within a very limited space, Yojisan brings a surreal revolution to a city of tradition.